Sometimes you need something strange. One of those things that you are just not going to find ready made at Target. For myself, I found myself needing one of those strange things after Hubby the Bikeman (James) put something very useful and not strange on my Bat- a wheel stabilizer. The front end of the bike was just so damn wiggly when parked that it was becoming a significant problem. 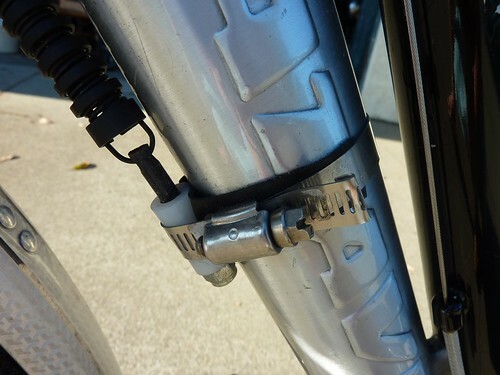 Whenever I parked the bike on the center stand, the front wheel would flop into me and I would get tangled in the handlebars or my hair would get tangled in the brake levers while I was locking up the bike. More than once, this ended up with either me or the bike falling over. The problem with putting a stabilizer on was that my lower tube is very thick and tear shaped so James had to improvise with bits and pieces not meant for this purpose. 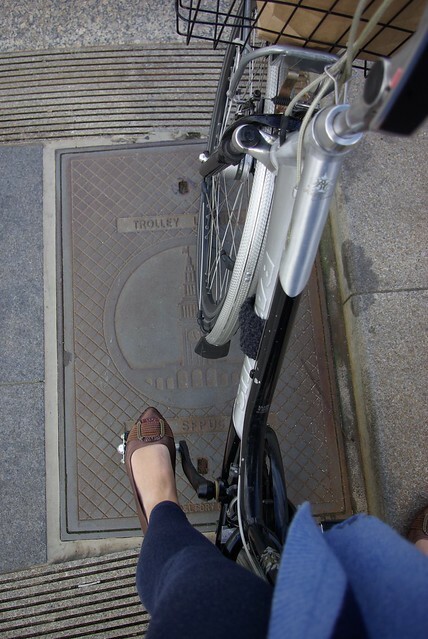 The stabilizer worked, but the mounting was ugly and it caught on my longer skirts or wider pant legs. Thus the need for the "strange thing". I needed something to wrap around the spring mount that would cover the metal that was sticking out. It needed to be removable in case we decided to adjust the mount. It had to be able to withstand the rain and sun, it would not be twine*, and it had to be made with stuff I had in the house. Of course, I decided to knit something! 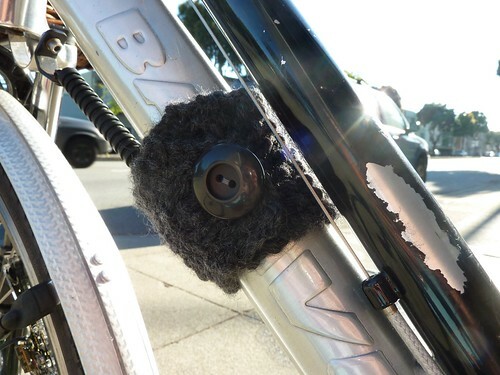 The World's First Wheel Stabilizer Cozy! It was terribly simple- bulky acrylic yarn, a big plastic button and 20 minutes of seed stitch later and I had the "much needed strange thing" in hand. It has been on the Bat for about 6 months and has done exactly what I needed it to. I have not been caught on the mount, or cut myself on it once since I put the cozy on. It isn't that noticeable on the bike, but it certainly serves quite a purpose. This of course what all "much needed strange things" have in common when we decide to make them for ourselves. What have you made for yourself? Share with the group! *twine is all and well and good, and lots of people think it is great but I can't stand it most of the time and refuse to have it on any of my bicycles. Sorry if you love twine. ** This article is cross posted at Change Your Life. Ride A Bike!. You can see from the picture that "impossible" is relative. Bike shop guys do not like to improvise. Oh, BTW, is your stabilizer noisy? Mine is terribly creeky, and I discovered that part of the spring is rubbing on the little bracket that it is mounted on. Just wondering if anyone else has had that problem. It creaks at times, usually when I really stress it by turning very hard. Usually, though, I do not notice it. I want to make some crochet skirt guards for my vintage Ralleigh! That will be coming soon!